What the MSRM WiFi extender does? AS the accelerating pace of the modern technology, the wireless LANs have become popular in some of homes and large enterprise office. The WiFi repeater can take an existing signal from a wireless router and rebroadcast it to create a new network. When two or more office have to be connected with one another over the protocol and the distance is too long (or a obstructions that may block the signal) for a direct connection to be established. 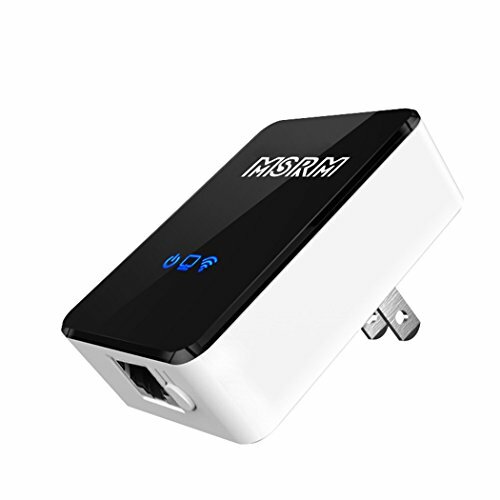 This wireless repeater is used to solve this proble, and the Wi-Fi signal will transmit from one repeater to another, to provide full Wi-Fi coverage solutions for the office area. Expand your wifi coverage,expand network everywhere, (no dead zones )with its range extender mode. Simple Operation Easy Use: Small size and wall-mounted design makes it simple setup customers can quickly setup according to the quick installation guide to ensure network is safe. Universal: Works with all brands 802.11 b/g/n of routers and service provider gateways. Please refer the Setup Guide before use. Effect the best wirelss coverage .You can easily achieve this effect by this little device. Designed specially for small business,office,home using.